RAMS-2003: The unit can be mounted to the RAMS 24-28 Pittsburgh Machine. 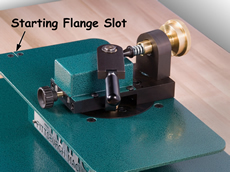 The RAMS-2003 Power Flanger will form a 7/32" right angle flange on either straight or curved pieces. 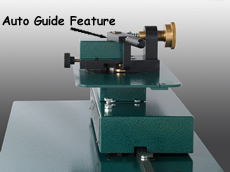 It has an adjustable “auto-guide", which can be set to automatically hold the metal for turning the flange on both a radius or a straight piece. This unit features Torrington Needle Bearings, hardened and ground shafts. 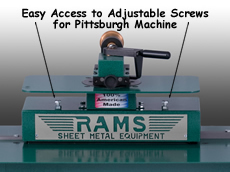 RAMS-2003-AA: The unit can be mounted to the RAMS 24-28 Pittsburgh Machine. The RAMS-2003-AA Power Flanger with Auto Adjust will form a 7/32" right angle flange on either straight or curved pieces. The Auto Adjust feature self adjusts from 24ga-28ga. No Manual adjustment needed. It has an adjustable "auto-guide" which can be set to automatically hold the metal for turning the flange on both a radius or a straight piece. This unit features Torrington Needle Bearings, hardened and ground shafts.